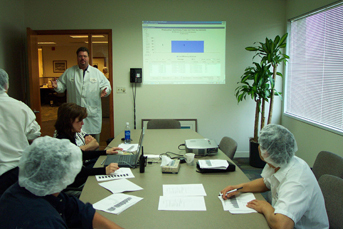 All of High Performance Packaging's training programs are on-site and specific to the packaging equipment you operate, downtime issues you encounter, and the products you run. Unlike used packaging equipment suppliers that only sell equipment, at High Performance Packaging, we understand it. We offer on-site training, helping your machine operators and maintenance personnel to better maintain, operate, and troubleshoot your used packaging equipment, specific to the applications you run. Without this know-how, it's a constant daily battle for your operators and maintenance personnel to keep the equipment running. Running equipment at high OEE is our focus, and High Performance Packaging understands that operators and mechanics need to understand the equipment and key parameters and control points. Their training helps our teams to meet KPI's. Knowledge of Key Performance Indicators (KPI's) is absolutely critical for your shop floor personnel. We can teach your operators and maintenance personnel how to measure and improve their performance during production runs, and the best practices for operating our used packaging machinery. Machine operators and maintenance personnel typically don't have any idea about the value of their roles in the organization, the value of extra efforts, and the financial consequences of poor and wasteful performance. High Performance Packaging shows them the overall picture of what it takes to bring customers in, bring orders to the production floor, and the costs associated with those efforts. We show your employees how easily profits can turn to losses, and how easily good customers can become past customers. You want the people who directly affect your bottom line to have the best training so they can make the best decisions. We hired High Performance Packaging to implement their performance improvement program. We were able to reduce our down time and increase line speeds on our machines as a result. But what had an even greater impact was that High Performance Packaging taught us how to help ourselves. We're still using techniques that they taught us. Evaluation of the operation, equipment capabilities, collection of downtime issues, and current skill levels. The information gathered is used in the training material. Development of focused training manuals geared towards the technical job requirements of technical personnel, used packaging equipment used in the operation, and solving downtime issues specific to the application in your operation. Train The Trainer training course designed to develop skilled trainers in your organization. Providing a Pre-training and Post-training testing database. The database is pre-programmed to pick random tests and retains answers to tests and test scores; and assists in scheduling trainees by similar skill levels.